Here at Pediatric Dentistry of Prospect, Dr. Danielle Haman-Smith is proud to be a long-time member of this great community, and she loves being actively involved with neighbors, Oldham County schools, and children of all ages who are in need of quality, compassionate treatment for their growing smiles. As a mother of two wonderful daughters, she understands a parent’s desire to provide their loved one with the very best. The dental care a patient receives at a young age can influence their attitude towards oral health for many years to come –our team takes that responsibility seriously, and we’re always kind, nurturing, and ready to exceed expectations. Dr. Danielle also has the experience and kind touch needed to treat both children and adults with special needs. 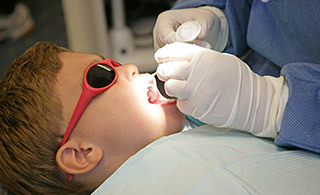 We look forward to getting your son or daughter started on the path towards a lifelong, healthy smile! Contact us today to schedule your first appointment, or if you have any questions or concerns we can help you with. Located in Prospect, our office also welcomes patients from River Bluff, KY and surrounding areas.